Katydids are classified as any of the species of grasshopper-shaped insects that belong to the taxonomic Family Tettigoniidae. They live nearly everywhere in the world and include 6,800 species with approximately 250 in North America. They can be difficult to find due to their excellent camouflage, but their song can clearly be heard in the summer months. They have very large antennae, and come in several different colors. But if you are lucky enough to find one, it can be easily identified by their leaf-shaped wings. They also have powerful back legs for jumping, and strong jaws. The name of the Katydid has a story surrounding it. As the old story goes, a woman named Katy fell in love with a handsome man who refused her and married someone else instead. After their honeymoon, the couple were found dead in the same bed. The bugs began arguing about whether Katy did it or not. So if you listen carefully you can hear them debating, “Katy Did, Katy Didn't." The katydid is an insect, and like all insects, they have 3 body segments, (the head, thorax, and abdomen), 6 legs, and 1 pair of antennae. Katydid's are shaped like grasshoppers and crickets, but have longer antennae. They are also covered in a exoskeleton, which provides support and protection for all insects. Most katydids are generally green, but brown, white, and even pink varieties have been found. Most katydids range from 1-1/4" to 5" long. Adult katydids have 2 pairs of wings that are shaped and colored like leaves. It also has long legs that enable it to jump long distances. Katydids can fly for short distances, but they prefer to walk and climb. They also use their powerful hind legs to jump long distances, just like a grasshopper or cricket. They use their smaller, clawed forelegs to climb up trees and crawl around on the ground. The insect respiratory system is made up of a series of tubes that originate from spiracles, which are openings of the exoskeleton that allows gases to be exchanged, and extend throughout the body. Internally, the tubes, or tracheae, look like thin white lines running through the animal's body. Trachea deliver oxygen to internal organs and tissues. The katydid circulatory system is open, meaning they don't have a complex network of veins and arteries to help transport blood throughout the body like humans and animals. Instead, the insects blood, called hemolymph, flows almost freely throughout the body. Only one vessel is present in the katydids circulatory system: the dorsal vessel. Posteriorly, the dorsal vessel acts as the heart, pumping blood forward into the anterior region, where it acts as the aorta and dumps the blood into the head. It flows posteriorly and is returned to the heart through ostia, which are small slits in the heart region of the dorsal vessel designed for the intake of blood. The katydids ventral nerve cord resembles a railroad track running from the head to the far posterior end of the katydid. This ventral nerve cord is actually made up of two nerve cords that run parallel to each other with a series of connective ganglia. The anterior most region of the ventral nerve cord is called the subesophageal ganglion. Just in front of that structure is the katydid's brain. Katydids can see fairly well, but have poor night vision. The katydids use their excellent sense of smell to find food. Their long antennae scan the air for whiffs of rotten fruits and other food sources. Their antennae can also detect danger. 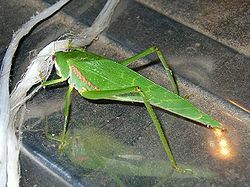 For example, a bug might feel the beat of a wing of a bat that is looking for an unsuspecting katydid that it can eat. Katydids also have good hearing. However, they do not have actual ears, they have a special organ called the tympana that is located on their knees. The tympana can pick up sounds that humans can't hear. The katydids sense of taste is good, as is it's sense of touch. For most katydids, the mating process begins with the male singing his mating song. The male "sings" by scraping his wings together. In most species, the female will respond with by quietly moving to the male, but in some, the female will respond with a song of her own. During copulation, the male deposits sperm onto the females genital opening. Within 15-20 minutes, the sperm enters the females body. The female then lays the fertilized eggs. She will generally attach the tan colored eggs to the underside of leaves. It normally takes 2-3 months for the eggs to hatch. Metamorphosis is incomplete in katydids, so the nymphs look similar to adults, except they lack wings and are very small. It generally takes 3-4 months to reach maturity,but since the average lifespan is about 1 year, their only social behavior includes courtship and mating. Katydids can be found nearly anywhere in the world. Depending on the species, katydids live in tropical, temperate, and arid climates. In the United States they are generally found in temperate or arid areas. They may even be found in some urban areas. 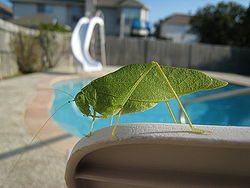 Katydids are generally herbivores, feeding on leaves, flowers, bark, seeds, and fruit. But there are some species that are omnivorous that will eat plants, and supplement their diet with snails, frog eggs, caterpillars, and even other katydids. Some have even been known to go after small vertebrates like snakes and mice. The katydid has several predators. These include bats, birds, some amphibians, mantids and even other katydids, to name a few. The katydid is generally a shy creature, and if you find one in the wild, do not startle it. At the first sign of danger, it will hop away, and if you aggravate it enough, it can bite you. In some cultures they are kept as pets, and their song is appreciated by people all over the world. God gave the katydid several ways to protect itself. Sometimes a predator will get too close for the katydid to feel safe. When threatened, a katydid can fight back, but it prefers to use it's long, powerful hind legs to jump far away and escape danger. But if this does not work, it has another defense that it can rely on. If it sees no way to escape by flying or jumping, it will use it's powerful jaws to inflict painful bites on the whatever creature chose to disturb it. It's bites can be so powerful, that it will pierce the skin of humans that startle it. Some katydids, like the Spiny Devil Katydid, have sharp spikes covering it's entire body. Family Tettigoniidae - Katydids by Cotinis. February 16, 2004. Bugguide, Iowa State University Entomology. Insect Anatomy Ent 4015 Ornamentals and Turf Entomology. Katydid legs Peter Chew, November 6, 2009. Katydids senses Piotr Naskrecki, National Geographic. May, 2006. Katydid species Dyanega. Wikipedia. November 30, 2009. Katydid facts HighBeam™ Research, Inc. 2009. True Katydids Herbert A. "Joe" Pase III, Texas Forest Service. This page was last modified on 29 October 2015, at 18:59.